OFS companies in the Bakken Play need fast, accurate rig intelligence from one comprehensive source to stay competitive. 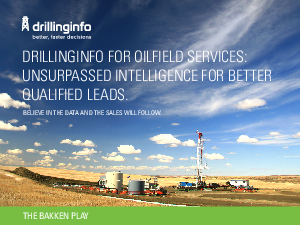 With Drillinginfo (DI) you’ll gain a competitive edge in the Bakken Play by using the best data and the broadest intelligence available. In this PDF you’ll learn how DI provides everything you need, from permitting and leasing information to rig locations, pricing trends, and more. While tracking prospects can be a lucrative opportunity, rigs move on a daily basis, so you need timely, accurate information. In this PDF you’ll see how Drillinginfo can drive your success by gathering the very latest rig intelligence from a comprehensive, easy-to-use SAS solution. Learn how to prepare for the next well event with DI Rigs Mobile App. With this invaluable tool you can enjoy the luxury of having your own office on the road. Easy access to rig and well event coordinates and driving directions via GPS units located on over 1,800 rigs make the DI Rigs Mobile App a must. Over the past half-century, activity in the Bakken Shale has produced one of the most significant oil advances in the U.S., with estimates predicting as high as a 40 billion barrel yield. To stay ahead of the heavy competition in Bakken it’s critical that your sales managers can work crucial data into an actionable format and use analytical tools to supplement lead intelligence. To find out more about making smarter, faster decisions based on unsurpassed rig intelligence in the Bakken Play, download the PDF here.